Most products that offer to extend your video wirelessly deliver poor image quality and create security issues by broadcasting unencrypted data—think wardriving for wireless video. The Belkin PureAV RemoteTV is the best wireless A/V extender we've seen, but its digital-image quality and strong security features don't come cheap. The RemoteTV is simple to use. Attach a source device to the transmitter, connect the receiver to a TV or video recorder, and enjoy. 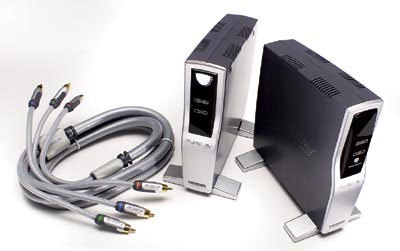 The receiver, which has an integrated antenna and is about the size of a hardback book, delivers composite, S-Video, and component connections. Buy one for every room that will receive video. Standard RCA stereo jacks handle the audio ins and outs. The transmitter also includes a set of A/V outputs that act as a pass-through for local viewing or recording. The only downside to all this transmitting and splitting goodness is the standard-definition video limit. At the heart of the system is digital video transmission using MPEG-2 compression. The RemoteTV goes a step further than most by encrypting the digitized video stream to prevent unauthorized eavesdropping. Another benefit of digital transmission is the lack of ghosting, noise, and most other forms of interference: You either see a picture or you don't. Using 5-GHz wireless technology with dynamic frequency selection, Belkin claims an operational range of 350 feet. In testing at 60 feet with at least four walls in between, we found reception to be quite good and the picture and sound quality to be agreeable. Besides wireless A/V transmission, the RemoteTV receiver can pass infrared signals from a remote control back to the source component at the transmitter. Any remote-control signals detected by the RemoteTV's receiver are then passed back to the transmitter, where they are forwarded along to the source device via an included IR adapter. Because of this, not only can you watch your shows from any room in the house, you can pause and rewind using a familiar remote. All told, the RemoteTV is the best wireless A/V extender we've seen, providing better range, connection options, and security than similar products. At $500, it's more expensive than we'd like, but it's easy to use and works well.